Rabbi Lizzi Heydemann serves as co-rabbi at Aitz Hayim Center for Jewish Living, a warm and dynamic community in her hometown, Chicago. Motivated by a passion for great music, spirited davening, rich Jewish conversation, and a progressive environmental and social ethic, Lizzi founded Mishkan, a minyan in Chicago designed to make those experiences more accessible to people of all backgrounds. Lizzi has been director, educator or rabbi in residence for the Brandeis Bardin Collegiate Institute, the Lishma summer yeshiva program at Camp Ramah in California, the Jewish Farm School, as well as for many college campus and birthright trips. She loves farmers markets, outdoor excursions, rollerblading, singing/songwriting performing, orange dark chocolate, and has run two marathons. All that Judaism is and stands for comes together in one place: Around the dinner table. Around the table, our lofty philosophical, ethical, ritual and agricultural values are put to the test. 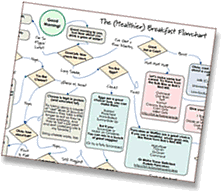 All of our blessings begin with the formula “barukh Ata Adonai Eloheinu melekh ha’Olam –– blessed are You, Living Spirit, Who created and permeates the Universe…” and then end with a concrete kind of food. “Boreh peri ha’etz –– Creator of the fruit of the tree” (for an apple, peach or almond). “Boreh peri ha’adamah- Creator of the fruit of the earth” (for a potato, strawberry, lettuce, or watermelon). “Borei minei mizonot –– Creator of the different types of grains,” for bran, a muffin or pasta or rice, whose main ingredient is grain. It makes sense, back in the Garden of Eden, the first man and woman were instructed to eat of “all herbage yielding seed… every tree that has seed-yielding fruit…” (Genesis 1:29). The original ideal for humanity was actually a vegan diet, and only after we left the Garden of Eden– i.e., after the Guiding Presence in the universe realizes that human beings have a kind of insatiable desire for the forbidden — that we are given a means by which to eat foods that weren’t Her first choice for us to eat, but that we can have if done in moderation and with conscientiousness, such as bread, meat, and foods that require agriculture and production to create. Which brings me to the last three blessings I haven’t yet mentioned. All of them bless processed foods: Bread; wine; and, literally, everything else (including everything from water to ice cream). The blessing that ends “haMotsie lehem min ha’Aretz –– Who draws forth bread from the Earth,” is the most ubiquitously known of these, and the one I will focus on here. It blesses what is now considered to be the staple of any Jewish meal: Bread. Bread is an incredible food whose Jewish blessing recognizes that the process by which a farmer puts seed into the earth to grow grain, the harvester cuts and dries it, the mill grinds it into flour, the baker adds it to water, yeast, eggs, heat and time, as equal to God’s acting on Eath — literally, all that equals God pulling forth bread from the Earth. Wait, you say, unlike the natural cycle of trees and plants growing and scattering their seeds, creating fruits, vegetables, and nuts that are all ready to eat without much human intervention, human beings do all the heavy lifting in bread production. Why bless God for taking it out of the earth? Because Judaism recognizes the presence of God in human agricultural and culinary activity. God is in the seed that scatters, the wind that blows, the water that feeds the earth, the hands of the farmer, the process of eating and digesting food. God — the life force of the universe — manifests as much in bread production as in a fresh peach, though the former takes a little more imagination to realize. Our tradition values and encourages eating foods that come from natural sources, unprocessed and unadulterated. But our tradition isn’t black and white. We also bless bread and wine. We also bless candy. We bless anything we put into our mouths because we’re deriving enjoyment from it, even if it’s not necessarily the healthiest thing. There is a divine ideal, but there’s also the real world we live in, with all its treats and temptations. We don’t live in Eden anymore. We are therefore invited to choose foods that nourish our bodies, grown in ways that support the planet, and also honor the many hands involved in food production. We can do it with our dollars, and we can also do it with our blessings. Try it sometime. Before digging into your next meal, look at the component parts: The sesame broccoli, the quinoa, the teriyaki tofu or chicken, the oatmeal-topped peach cobbler. Consider where each part came from, hold a bite of it in your fork or between your fingers, and imagine where it grew (on a tree, in the earth, in a vineyard, on a farm, in a coop…), all that went into its arrival here, on your very plate. Bless the Source of this incredible process, this nourishment. Your life, certainly your experience of eating, and of Judaism, may never be the same. 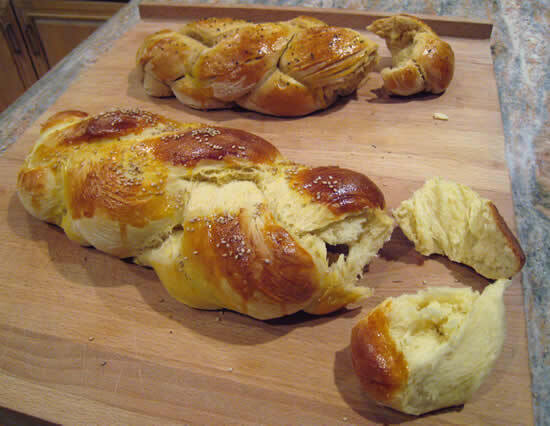 This is the challah that my (Andrew's) mom would make when I was growing up. It's sweeter than most, and it's definitely challenging not to eat too much of it. Oh, and it makes incredible French toast on Sunday morning. Makes one 1.5 pound loaf. Mix yeast and lukewarm water. Add sugar and salt and stir well. Add eggs and beat with beater. Add oil and beat slightly. Combine both flours together. Gradually stir in 3 cups flour, mix well. Add a little more, up to 1/2 cup, if dough is too moist. Place on floured board and knead for 3 to 4 minutes. Place dough in lightly oiled bowl, and cover. Loosely cover and let rise until tripled (2 to 3 hours). Punch down dough, then divide into 4 parts. Roll each part into ropes. Let it rest a little, just a few minutes, so it will be easier to braid. Turn around and braid from the center strands "under 1 and over 2," with alternating sides. Beat egg yolk, then brush on top of braided dough. Sprinkle with poppy or sesame seeds. Let rise 10 to 15 minutes. * Mom used to make this recipe with regular, unbleached flour. Now she makes it with half white whole wheat flour and half regular flour. The ones pictured above are both types -- and even mom reports that everyone liked the whole grain version more. ** If you need a little help on the braiding, check out this video, which I think is the same technique mom uses. Or, here's another good technique that starts on one end instead of the center. What an absolutely lovely and beautifully written post. I want to print your entire piece, recipe and your “words”. I totally agree with Liz – Beautiful and Meaningful on many levels. Rabbi Heydemann, I do hope you publish other writings of yours for the World. Fascinating vegan reference. Toda! Mmm yum. 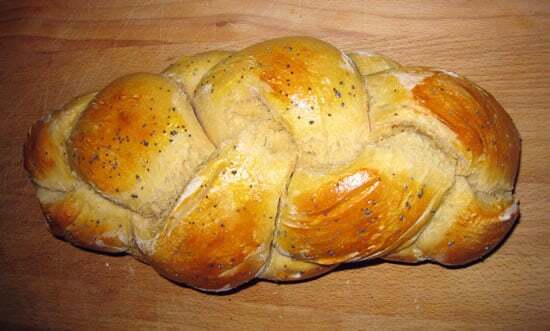 Haven’t made Challah in a while, maybe it’s time again. When I say grace (Christian) before a meal, it tends to get long-winded, because I try to give thanks for every ingredient and all the people who had a hand in getting it to my kitchen. Nice to know I’m just following an ancient tradition! Lizzi, I miss you so much! You have once again remarkably and spiritually brought us back to our roots. You so beautifully connect us to earth and a spiritual awareness of the holy work of growing and producing food. – and Thanks for the recipe, Andrew!